I always say that pilot can only be truly appreciated in retrospect. You can’t know how good it is until you see how the whole season—sometimes the whole series—plays out. So I’ve waited until now to blog about The Walking Dead. This show, which had a 6-episode first season on AMC, has been reviewed and analyzed extensively, for the most part favorably (in places like these.) So I won’t bother raving about how entertaining, exciting and original it is. Though it is all of those things. The thing to understand about this show is, it’s not a zombie show. It’s a suspenseful, end-of-the-world drama that just happens to have zombies. The pilot lets us know that, giving us rich character introductions and a bleak, ominous landscape. The opening scene lets us know something isn’t right. 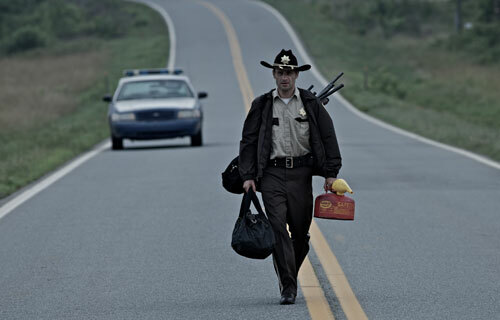 A police officer, Rick Grimes (Andrew Lincoln), parks his squad car and makes his way through an intersection littered with overturned vehicles. Beyond that he finds an abandoned camp site where bodies rot in cars. Rick appears completely calm, as though he is finding only what he expected. And, while the sight of him putting a bullet in the forehead of a little girl with a teddy bear and half a face packs a punch to the audience, it doesn’t seem that out of the ordinary for Rick. In hindsight this opening scene feels odd. Where are we? When are we? When Rick first leaves the hospital, trying desperately to figure out what happened to the world during his coma, he is understandably freaked out. He doesn’t know the ways of the new frontier until at least episode 2. Suddenly it’s not clear when in the timeline of the show this scene takes place; maybe we haven’t seen it yet? Why did the writers choose this point of attack? Just to shock us with Cindy Lou Who getting her head blown off? Rick shows much more emotion when, mid-way through the pilot, he shoots the half-woman crawling across the lawn. A flashback is used to set up the relationship between Rick and his partner, Shane (John Bernthal). This relationship is crucial to the story arc, and its position in the script suggests that. The writers don’t miss a chance to also mention Lori (Sarah Wayne Callies), the woman who will represent the point in their love triangle. In the chase of a suspect, Rick and Shane are clearly the competent ones. More importantly, they’re both basically good guys. They have each other’s backs, and together they defend the public good. These characteristics will leave us torn as the story unfolds, unable to paint Shane as a hero or villain. This will prove especially true in the opening scene of episode 6, in a flashback to when the hospital was overrun with zombies. The relationship between the men is also a source of frustrating dramatic irony later in the pilot, when Rick radios through to the campsite having no idea Shane is there. We don’t get to know any of the other characters in the campsite at this stage. We see just enough to see that a group of survivors is making the best of it on the outskirts of town. The pilot spends a good chunk of its 66 minutes having us get to know the character Morgan (Lennie James); he has a big dramatic introduction and the possibility of a reunion with Rick for later on. There’s no payoff through, at least this season. Morgan, although a rich character, winds up being no more than a device for explaining the world to the viewing audience. (I, for one, want to know if he ever shoots his wife). One of the questions running through this episode—for viewers, not the characters—was “how far will they go?” This is a horror show on basic cable. The opening with the little girl gives a pretty strong hint, but we wonder how gross, how shocking, how scary AMC will be. The show does not disappoint in this respect. The pilot leaves us with a bizarre, gag-worthy gut feast that didn’t let us forget about the show until the following Sunday.